Amidst the backdrop of the barren desert and sparse vegetation, lies this surrealistic abandoned village which reflects a rich historical past of the prosperous paliwal brahmans,who originally hailed from Kashmir. If you are keenly interested in haunted places and you love horror stories then Kuldhara Village in Jaisalmer is a must visit a place. The village is so prominent that each of the village living there just left the place in a night. Kuldhara village horror story makes this place spooky. Kuldhara is a lonely place that conveys sorrow about the bound destiny of its villagers leaving its village. Legend has it that they orchestrated an overnight exodus, failing to cope with the atrocities of the local minister called Salim Singh, who took fancy for the village chieftains beautiful 16 year old daughter. Replete with folklore of ghostly hauntings, this village is what legends are made off. The locale is a photographers delight as it has a deluge of artistic angles, only to add to your canvas. A must see for people for a penchant for photography. Floating village is a cultural heritage of Halong Bay. Vietnam people have been living in these houses for hundred of year with fishing as the main income activity. It is a magically calm place, an escape from the hustle of Vietnam streets. The Visitors often travel to enjoy life in some villages such as: Vong Vieng Village, Cua Van Village, Ba Hang Village or Cap De Village in Hung Thang Commune. Cua Van is the largest village with about 130 floating houses. Gavi, mainly known for its wildlife is an eco-tourist spot in Kerala which has widely become popular after 'Alistair International' the world acclaimed tourism major listed it among the leading eco-tourism centres and one of the must-see places in India. Endangered species including the Nilgiri Tahr and Lion-tailed macaque are often sighted at the outskirts of Gavi. With more than 260 species of birds including the great pied hornbill, woodpecker, and kingfishers, Gavi is a heaven for birdwatchers. A must visit place for all nature lovers as Gavi is preserved in its natural scenic beauty untainted by the mighty hands of modernity. Chaubatia is a settlement in Almora district, in the state of Uttarakhand, northern India. Chaubatia is 1,800 metres (5,906 ft) above sea level within sight of the western peaks of the Himalayas. It's name literally means a common meeting point of four paths ("chau" meaning four and "bat" meaning path). It is named this way because of its location at the intersection of four cities: Bhargaon, Ranikhet, Dehrti and Pilkoli. Chaubatia is best known as the location of a botanical garden and fruit orchard which are popular with tourists to the region. The gardens contain predominantly apple, peach, plum and apricot trees. There is a village in Sundarban called “Widow Village” where most of the families have been attacked by the man eater tigers. Tigers always used to attack from behind. So, fishermen used to wear facemask at the back of the head to confuse the tiger still the tiger was cunning enough to figure that out and attack by the tigers continued. Khajjiar is not only famous for its thick and lush green carpet wrapped around the tall pine trees but also known for its pleasant & tiny villages like Rota, Ladi etc. These villages are located at slopes nearby. Within the boundaries of the khajjiar area, these villages are quite near to the ground of Khajjiar not far from each other around the tall deodar forests of Khajjiar. The location of the Khajjiar villages is extremely prominent. You can have the breathtaking view of the hills from here. No doubt, the whole Khajjiar area is a magical paradise. These small villages are quite popular for their Apple orchards in this area. Imagine yourself surrounded by lush green spaces, streams and tracks, having majestic Himalayan mountains in the backdrop, it is nothing less than a magical feeling. A trek to Dayara Bugyal will turn this into reality. It is ideal for a weekend trek. Dayara Bugyal is considered to be one of the most beautiful alpine meadow in India. The region gets heavy snowfall during winters. Amongst all the treks in Uttarakhand, Dayara Bugyal is considered to be most breathtaking. While on the Himalayan Dayara Bugyal trekking tour, catch the sight of the lake Barnala Tal. The trek to this beautiful natural wonder commences from the foothill town of Uttarkashi. It starts from Basru on the Haridwar-Gangothri road. Then, the route trails through the beautiful oak forests, clear water bodies and sprawling grasslands, valleys and high rise mountains. It is a perfect destination for overnight camping. The area serves as a venue for some excellent skiing experience during the winter months. Many of the travel enthusiasts have described this trekking as a fairy tale. In the outskirts of Pithoragarh is Jhulaghat Village in Munakot Tehsil. Jhulaghat is situated at Indo-Nepal border and is best to be visited during winters. River Kali flows through the town and the climate is cool, covetable and soothing. It is a special bridge at the river that joins India and Nepal. The village derives its name from a hanging bridge across this river. You can find pretty amazing Nepali goods from the market areas. One of the major attractions of this place is the musical Ramlila played during winters for more than 105 years. Jhulaghat is known for its sacramental valleys and picturesque views. The Kamakshya Mandir and Bhagwati Mata Temple are also huge interests for the visitors. Chicham is a very remote and small hamlet in the Spiti valley. It is so remote that in order to get to the village an adventurous cable car ride has to be taken over a 110 m deep gorge. It is a very small village with about 100 people living in 30 households. There is a home stay which provides spectacular views and authentic local food and drinks. It is the perfect starting point for a trek. The Spiti area offers some of the best trekking in the Himalayas. In the northeast of Coorg is Somwarpet a land marked by various crops. The major plantations of Somwarpet are coffee and spices like pepper, ginger, cardamom etc. Somwarpet offers some adventure activities like trekking and rock climbing which excites the visitors. It is well known for authentic Coorgie cuisine especially the non-vegetarian dishes like Chicken curry, pork curry, with Kadubittu (steamed rice dumplings) and Akki roti (rice roti). Locals here speak a variety of languages like Kodava Takk, Are bhashe, Tulu, Beary bhashe, Konkani, English, and Hindi. Kannadjgar is also spoken by a few. There are several attractions near Somwarpet like the green lands of Beerlor Golf club, the Mallamaleshwara betta which is well known for poojas and Shivratri celebration, the Kottabeta peak, and the Mallali falls falling 200 ft. down at the feet of Kumardhara river. There are numerous waterfalls in this region that add on the splendor of Somwarpet. The small town of Maibong is rich in scenic beauty and natural grandeur. It is the ancient capital of the Dimasa Kachari Kingdom. The place is located at a distance of about 45 km from Haflong and retains the ruins of the kingdom even today. Its major center of attraction is the two-roofed monolithic temple, known as the Ramchandi Temple, which bears an inscription dating back to 1761 AD. The Mahur River also flows by Maibong, which offers a great tourist attraction. Chettali is a small village in Madikeri, abundant in hills, greenery and coffee plantations that enhance its scenic beauty. It is safer to carry light winter clothes even in clear weather as the weather in this small village goes wild any moment. The terrain is amazing to have a bike ride on the roads sandwiched between the coffee and cardamom. plantations and the refreshing environment. The velvety view of hills is mesmerizing and waterfalls make the scene divine. The tiny village Chettali in Coorg is a home to several tourist's attractions like the ancient Cherala Bhagavathy temple amidst the spiritually pleasing landscape. The village has world-class cardamom cultivation and also a coffee research station for research in cultivation and diseases of different varieties of coffee. There is a central horticultural experiment station located in Chettali, it is regarded as one of the largest research centers of its kind in Asia. 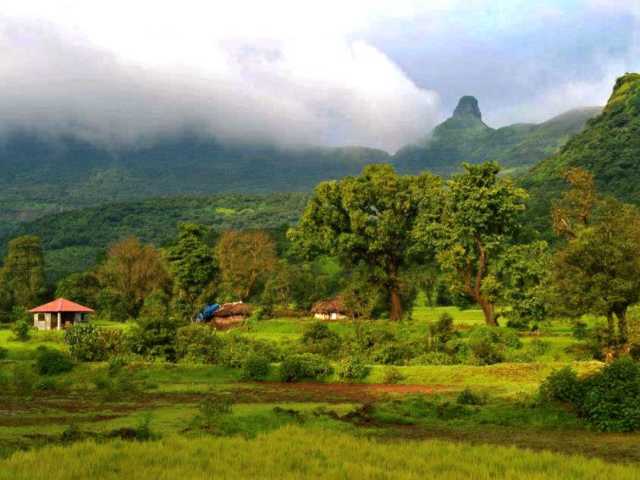 The heart of Karsog valley is this beautiful green retreat. The village Chindi is located amidst wide orchards of apples and dense hilly forests and green cover of Deodars and Pine trees. The fresh and clean air of the village rejuvenates your senses instantly. You would meet the villagers near small tea stall, that would be a traveller experience to talk to them. Chindi is an offbeat village untouched from the commercialisation.